This is the latest in a series of entries looking at what we can expect in 2013. Each weekday, a guest analyst will look at the key challenges facing a selected country – and what next year might hold in store. Editor’s note:Alex de Waal is executive director of the World Peace Foundation at the Fletcher School. The views expressed are the author’s own. Eighteen months after the secession of South Sudan, its future is still tied to its northern neighbor and former mother country. In 2013, Sudan and South Sudan will rise or fall together. If the two can overcome their rancor and work together, both can be economically viable and rebound from their respective economic crises. If not, both countries may become ungovernable. At a summit in the Ethiopian capital Addis Ababa on September 27, 2012, South Sudan’s President Salva Kiir and his Sudanese counterpart Omar al-Bashir signed a series of agreements to resolve the outstanding business left over from the secession, to settle the disputes that had brought them to the brink of all-out-war in April, and to reopen South Sudan’s oil production – source of 82 percent of its GDP. But they haven’t been implemented yet. One pillar of the agreements is economics: South Sudan resumes export of its oil using the infrastructure (oil pipeline and terminal) in northern Sudan, with a transitional payment to the government in Khartoum to help cushion it from the fiscal shock that followed the loss of 75 percent of its oil production when South Sudan seceded. The two countries also agreed a joint approach to international donors for debt relief and development aid. Sudan is under financial sanctions while South Sudan’s economy, already one of the poorest in the world, shrank by more than half after its shutdown of oil production in January 2012, in a dispute with the north. The second pillar is security: a demilitarized and internationally monitored border and an end to supporting rebels fighting against the other. South Sudanese are particularly frustrated about the north repeatedly stalling on agreements to allow the people of Abyei Area, which lies on the border, to vote in a referendum to decide whether they belong north or south. The northerners accuse the southern army of harboring and supplying a range of rebellions ongoing inside northern Sudan. 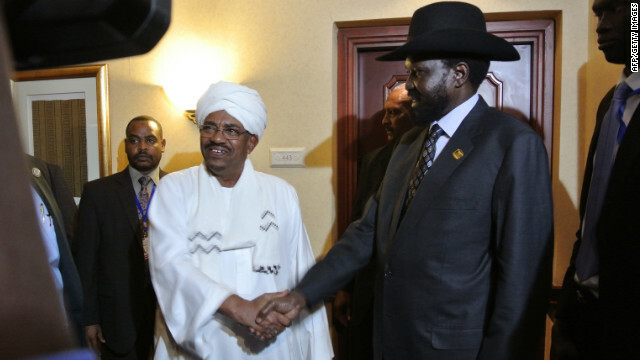 Implementing the agreements would seem to be a win-win for both President Bashir and President Kiir. Both desperately need the money to stave off destabilizing austerity and popular discontent. But each leader is weak in the face of the veto power of members of their own oligarchies with special interests, including generals determined to salvage the pride of their military establishments, and the rival constituencies with an interest in Abyei, each of which is resolute that the area should not be forfeited to the other. The two countries’ long term needs are hostage to these short term calculations. Northern Sudan desperately needs a political leadership with a vision of the country’s future as a democratic African nation, respecting the diversity that still characterizes Sudan after the loss of the South. Northern Sudanese feel a deep sense of betrayal: with the Comprehensive Peace Agreement of 2005, which brought to an end more than 20 years of civil war, Sudan was promised peace, unity and good relations with the West. Eight years on, none of the three has been achieved. The international community needs to be respectful of that grievance, and mindful of the dangers it may entail. The world’s newest state, South Sudan faces enormous challenges in meeting its people’s aspirations for development and good government, neither of which are currently in evidence. South Sudan’s credibility was damaged by its reckless actions during 2012, but still commands much international sympathy and solidarity. Its prospects will be helped by some tough love from foreign friends. Reblogged this on All Things Geography. This is what should take place between the Turks and the Kurds, or better yet, between the Spanish and the Basques next year but won't, tragically enough. By the way, the Russians would do quite well to grant the Chechens the independence they deserve, too! Or Catalans you mean. In fact one could make a case for the breakup of the UK, of Belgium, of Armenia, of Azernbijan of Iraq, of Iran, of Egypt as well. Only Israel has to be wiped off the face of the earth by an imposed ethnic overload solution. This is the liberal way. Both of these monsters should be on trial at the Hague, you'd be doing both countries a favor. I'm not sure the author understands Sudan. The arabs will continue to discriminate against and intimidate (if not outright attack either directly or through proxy militias) the black Christians in the south. This is a cultural conflict in which one party (the arabs) completely discounts the other party's (black Christians) value as human beings. The international community needs to stop coddling Sudan as a reasonable party in this conflict. What? I see no joke and consider myself a fan of comedy. Can you explain the joke for the rest of us? I completely agree with the above posting by Jeb. Take this a step further, if I may, and apply this to the whole of the continent. Where blacks governing themselves fail miserably on almost every level, To care for one another, defend their countries, and maintain and credible government. The same is true for the Caribbean also, eg. Jamaica, Haiti, Liberia. In fact, within their own communities in the Americas and France there is a deep seated dysfunction in how they govern themselves and how they conduct themselves in our societies. Broken families, violence, gangs, crime, and a general disrespect for others and law. Not all are like this but it is an undeniable presence and is baffling. I agree. Blacks cannot govern themselves. Black US culture is an absolute failure. Blacks in Canada and the UK are a drain on our societies. In the Caribben and Africa their governance is an absulte failure. South Sudan will be a failure too. alex de waal is bull crap. it is a special to cnn the propaganda network along with all others. want to know about the sudan or congo read keith harmon snow. Also worth mentioning that al-Bashir has terminal throat cancer which is creating a power vacuum in the North and further complicating things. Sudan is going down the toilet, just like every other country that is dominated and run by Islamic Jihadi nut jobs!! Good luck to everyone else that doesn't follow Islam in any of these countries. If you don't get murdered for not believing in their jihadi cult, you are definitely in for a rough ride! Why in heavens name the world supports creating another islamic jihadi state (Palestine) is beyond me! Does the world really need another place where non believers are oppressed or killed?? Have you heard about the muslim who shot Jews in France yesterday? Its not just Islamic countries. Although why France would have a problem with Islamists is unknown, they are not America and should be policing their borders better to NOT let the crazy people in. f*uck all of you who commented on this and you too CNN. By the way Bashir sits in the UN Human Rights Commission and is ferried about on UN aircraft because were he to use any other method he'd be ferried to the ICC to respond to his indictment for war crimes. So if that's good enough for the UN that's good enough for me. Personally, I hope he adopts cannibalism as well because watching the UN ignore that would be worth it. I like this article by Mike Jason. This man is impartial and he gave both South and North Sudan justice. I hope the South will listen to the voice of reason and stop meddling in the North affairs. The South need to rebuild its economy and pull its people out of the abject poverty and misery. Let us put ideologies aside, both the people of the South and North Sudan deserve the best in 2013! Sudan's autocrat Omar al-Bashir is the problem, but his counterpart in South Sudan Salva Kiir may not be any more democratic than in his old days, as he was vice-president of all Sudan, but had long supported full independence for the south. suppose not to be so.please draw the line. independence state should be independent. south sudan leadership must work towards showing its people and the world at large that they are different or there was a cause of them fighting to become independent. Instead of concetrating all their focus on border issue with the north, they should raise such issues through the UN and focus on solving pressing or dire needs of the local people. As of now the leadership is embrodied in corruption. this can not help at all. the sudaness people have had enough of those wars and should be given a chance now to solve their lifehood. all they demand or need is building of infrastructure like schools, hospitals, roads, electricty etc and creation of a condusive environment for business. south sudans should also consider (in the near future) about setting up refinaries for it oil so that they can also benefit of the linkages associated with the oil industry as a whole.